For baking soda, see sodium bicarbonate. For the programming principle, see Tim Toady Bicarbonate. "Hydrogen carbonate" redirects here. For the oxoacid, see carbonic acid. Bicarbonate serves a crucial biochemical role in the physiological pH buffering system. 3) per sodium ion in sodium bicarbonate (NaHCO3) and other bicarbonates than in sodium carbonate (Na2CO3) and other carbonates. The name lives on as a trivial name. A bicarbonate salt forms when a positively charged ion attaches to the negatively charged oxygen atoms of the ion, forming an ionic compound. Many bicarbonates are soluble in water at standard temperature and pressure; in particular, sodium bicarbonate contributes to total dissolved solids, a common parameter for assessing water quality. 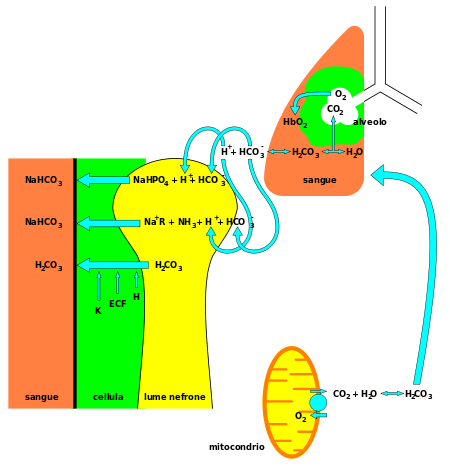 CO2 produced as a waste product of the oxidation of sugars in the mitochondria reacts with water to form H2CO3, which is in equilibrium with the cation H+ and anion HCO3−. It is then carried to the lung, where the reverse reaction occurs and CO2 gas is released. In the kidney (left), cells (green) lining the proximal tubule conserve bicarbonate by transporting it from the glomerular filtrate in the lumen (yellow) of the nephron back into the blood (red). The exact stoichiometry in the kidney is omitted for simplicity. 3) is alkaline, and a vital component of the pH buffering system of the human body (maintaining acid-base homeostasis). 70–75% of CO2 in the body is converted into carbonic acid (H2CO3), which can quickly turn into bicarbonate. With carbonic acid as the central intermediate species, bicarbonate – in conjunction with water, hydrogen ions, and carbon dioxide – forms this buffering system, which is maintained at the volatile equilibrium required to provide prompt resistance to pH changes in both the acidic and basic directions. This is especially important for protecting tissues of the central nervous system, where pH changes too far outside of the normal range in either direction could prove disastrous (see acidosis or alkalosis). The most common salt of the bicarbonate ion is sodium bicarbonate, NaHCO3, which is commonly known as baking soda. When heated or exposed to an acid such as acetic acid (vinegar), sodium bicarbonate releases carbon dioxide. This is used as a leavening agent in baking. The flow of bicarbonate ions from rocks weathered by the carbonic acid in rainwater is an important part of the carbon cycle. In diagnostic medicine, the blood value of bicarbonate is one of several indicators of the state of acid–base physiology in the body. It is measured, along with carbon dioxide, chloride, potassium, and sodium, to assess electrolyte levels in an electrolyte panel test (which has Current Procedural Terminology, CPT, code 80051). The parameter standard bicarbonate concentration (SBCe) is the bicarbonate concentration in the blood at a PaCO2 of 40 mmHg (5.33 kPa), full oxygen saturation and 36 °C. Reference ranges for blood tests, comparing blood content of bicarbonate (shown in blue at right) with other constituents. 1 2 "hydrogencarbonate (CHEBI:17544)". Chemical Entities of Biological Interest (ChEBI). UK: European Institute of Bioinformatics. IUPAC Names. 1 2 3 "Clinical correlates of pH levels: bicarbonate as a buffer". Biology.arizona.edu. October 2006. ↑ William Hyde Wollaston (1814) "A synoptic scale of chemical equivalents," Philosophical Transactions of the Royal Society, 104: 1-22. On page 11, Wollaston coins the term "bicarbonate": "The next question that occurs relates to the composition of this crystallized carbonate of potash, which I am induced to call bi-carbonate of potash, for the purpose of marking more decidedly the distinction between this salt and that which is commonly called a subcarbonate, and in order to refer at once to the double dose of carbonic acid contained in it." Look up bicarbonate in Wiktionary, the free dictionary.